Back in the childhood years, one of the fortunate activities I had as a kid was to ride very miniature motorcycles on private secondary roads. There were lots of woods and trails to be explored. With the private property that was recently brought back to the family, the thoughts of returning to the hobby increased. Who says you can't go back? Back in the day, it was called enduro riding. The bikes were basically off road - but were street legal. Today's enduro riding has an element of structured racing. I'm not about how fast you can make the route - but how much fun you can have. The fact that the routes go though some of the most beautiful lands doesn't hurt. Michigan is very off road friendly and has many trail systems that are maintained in cooperation between users and the DNR. I belong to - or subsidize - two clubs. 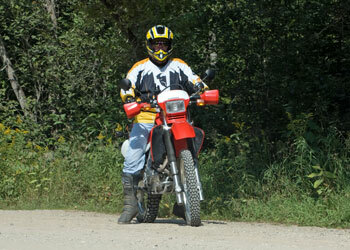 The Michigan Cycle Conservation Club has a very large presence for off road enthusiasts. They keep track of legislation that goes through Lansing. They have a nice monthly magazine that does keep up with Michigan news and laws. They have a limited dual sport interest - for the most part their events are focused to the off-roaders. The majority - if you can call two to three rides a year - of the rides I attend are with the Great Lakes Dual Sporters Club. The members are very friendly, outgoing and so far have suffered my 'speed' on the trails. The folks who run this club are very good at providing great routes with a diversity of challenges. 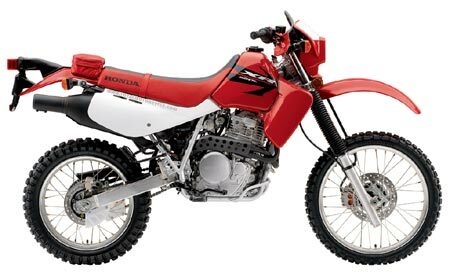 I ride a 2006 Honda XR650L. Some in the club call it 'Beginner's Red' and when I grow up I'll go orange (KTM). I went with the Honda because it is bullet-proof. It won't leave you in the woods - unless you are last in the pack. There are lots of modifications available as the basic bike has not changed in years. My Honda shop manual starts at 1993 and has stickers to update the years. The information hasn't changed much.